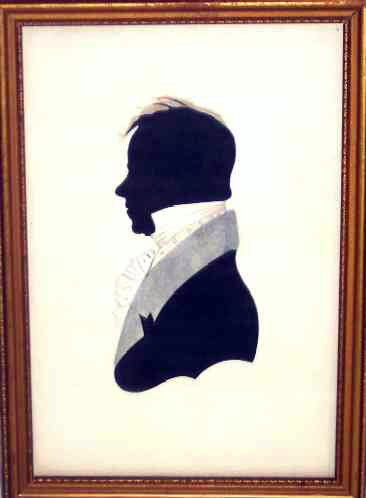 Hollow Cut Silhouette with Watercolor embellishments of a gentleman identified on the reverse as David Townsend, Jr.
David was born June 2, 1777 in Waltham, Massachusetts to David Townsend and Sarah Jensen. He was one of 11 children. He married Elizabeth Dix and between them they had 9 children. He was a cabinetmaker by trade and also the keeper of the Bird Tavern according to the written information the back of the frame. The silhouette is in exceptional condition with wonderful detail using a variety of mediums. The background paper is an ivory color which really sets off the china white detailing on the frilled shirt front. The size is larger than we usually see in this type of silhouette and it is very impressive. 7-1/4"high x 4-3/4" wide.